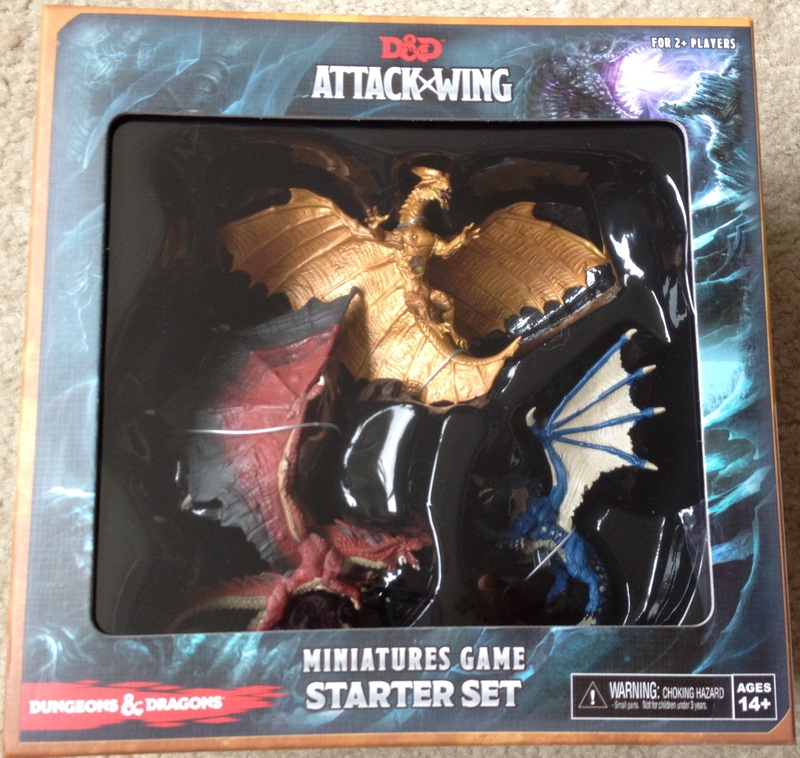 On November 5th, WizKids/NECA will release their newest game, D&D Attack Wing, to North American audiences (Certain retailers in the States received theirs on 10/29). Attack Wing originally started out using the Star Trek license, but since WizKids also has the Dungeons & Dragons license, they’ve decided to create a version of the game with that. As a long time fan of Heroclix and the old Dungeons & Dragons Miniatures tactical wargame, I was very excited to hear of these games, and doubly so when I was sent a copy of the starter kit to review. Although I will eventually review the game later in the week, I thought I’d show you what all comes in the Starter Set. 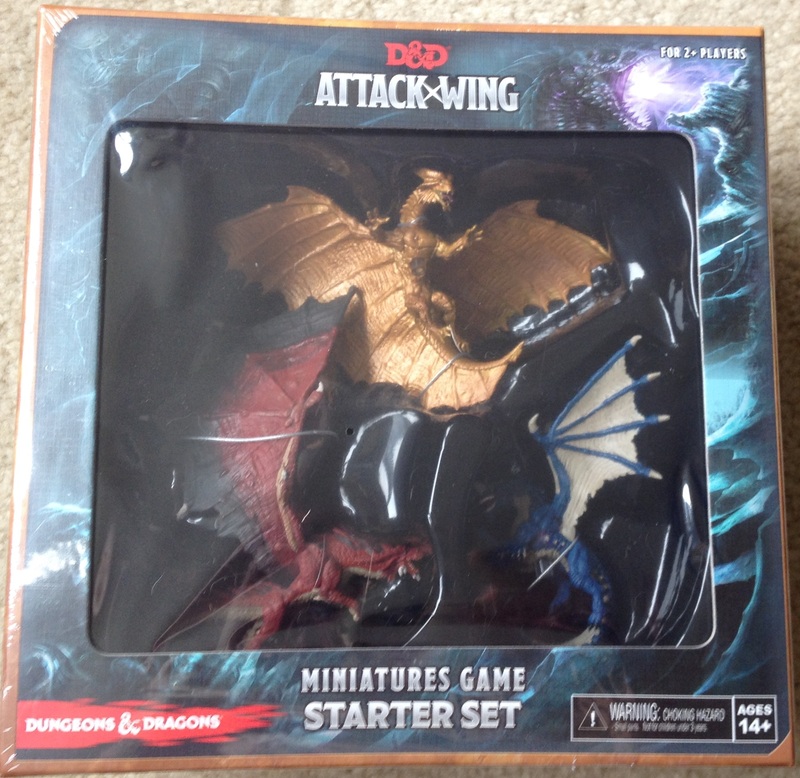 Below are twenty five pictures that detail my unboxing of the D&D Attack Wing Starter Set. If you click on through to each picture, you’ll get a much larger, high-definition image so that you can view things in more detail. Now, let’s look what your $50 ($39.99 on Amazon.com) nets you. 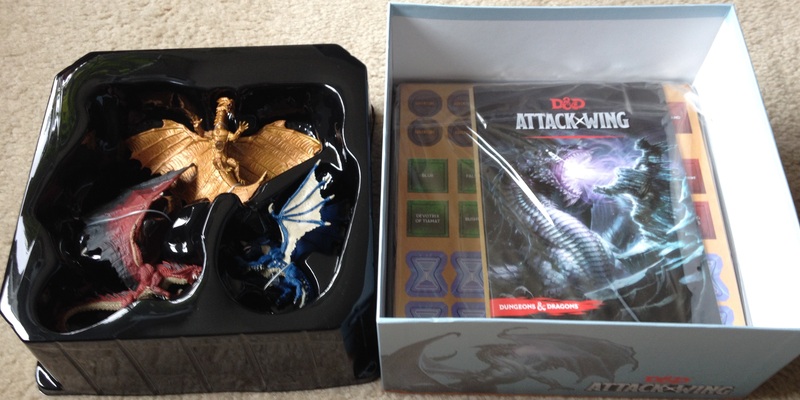 First up, here is a picture of the starter set straight out of the mailing container and still shrink wrapped. It’s a little blurry on the lefthand side because of this. What you can’t tell is how HUGE this starter box is. It’s about the size of the Robotech RPG Tactics box set (whose unboxing you can see here), which sounds insane at first when you notice D&D Attack Wing only has three minis. Why is it so big? What all could this box contain? Here is the box without the shrink wrap on. 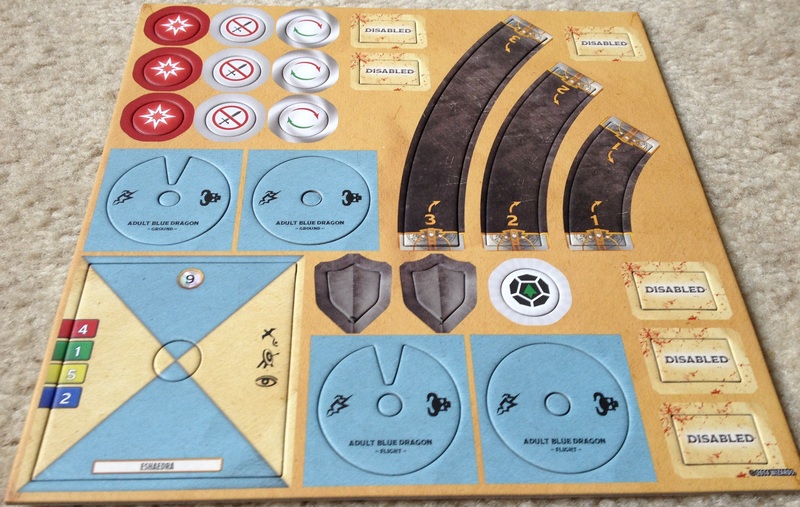 Here is the Starter Set with the first lid. Yes, FIRST LID. 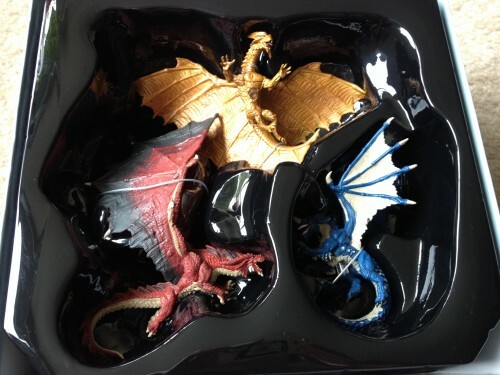 Notice that in this picture, there is still a plastic lid over the dragons. I have to admit, this is about as shoplift-free as possible. So the second and final lid is off. Now we have a nice closeup of the three dragons. 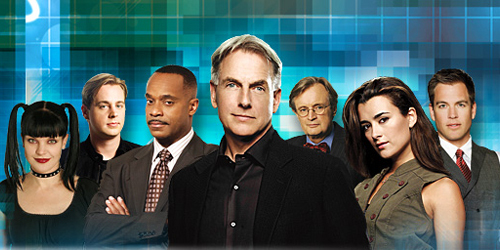 Still, there has to be more to the giant box than these three. 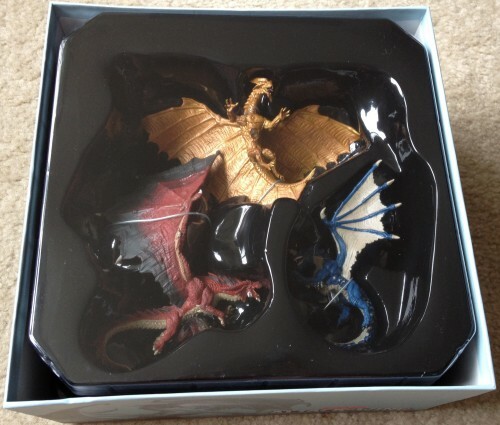 If you rattle the box around you can hear a lot of noise coming from underneath the black plastic container holding the dragons in. Shall we see what is under there? Once we lift up the black container holding the dragons, you can see there is a lot of stuff underneath – kind of like buried treasure. Here I have pulled everything out of the box. There’s so much stuff though, it’s going to take two pictures to show them all. 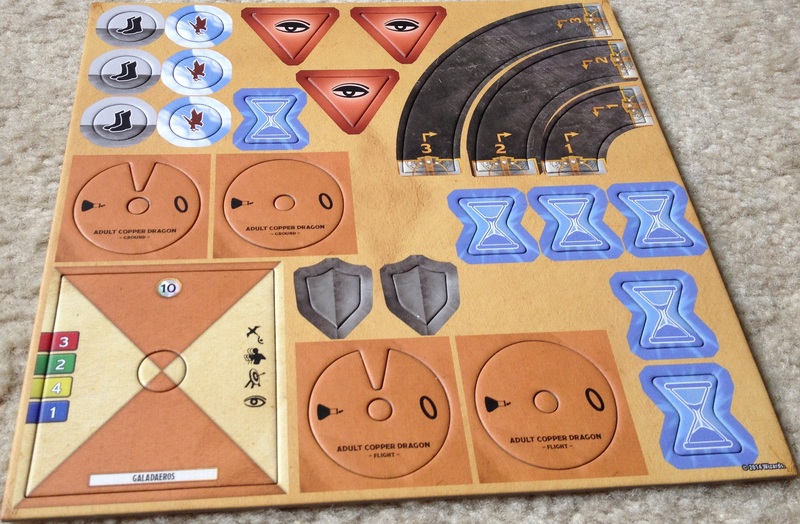 In this one you can see the shrink wrapped rulebooks and cardstock pieces that need to be punched out. There are also two long sticks. One is a range ruler and the other is a straight line maneuver template. 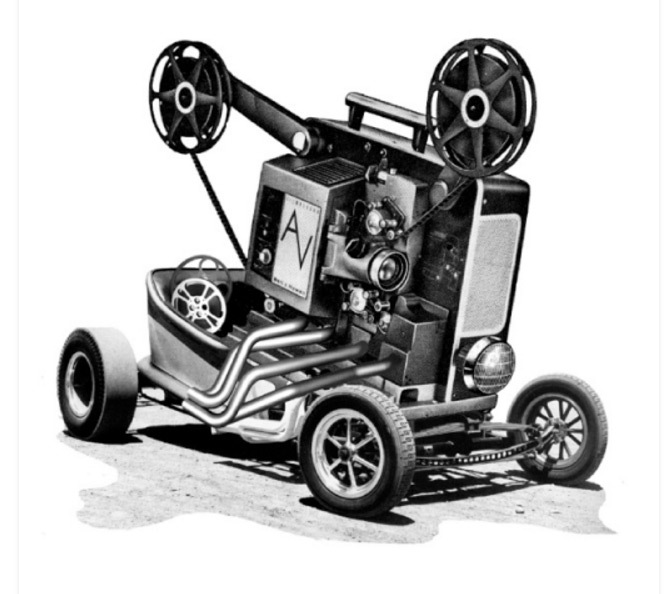 Don’t worry about understanding these names and terms – that’s what the review will be for. Here’s the second picture showcasing what all you get in the box. Here we see a lot of dice (all eight sided) and two sets of cards. 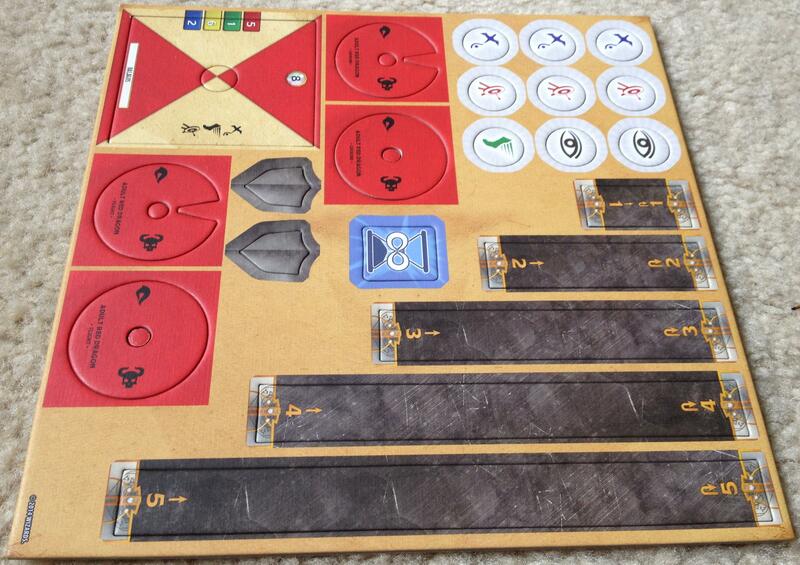 Here’s a close up of the range rule and straight line maneuver template. Here is a close up of the dice for D&D Attack Wing. Notice they are all eight sides, but some are green and some are red. As well, if you take a close look, you’ll notice these are all custom dice. There are no numbers. Instead, the green dice have some sides that are blank, some with an eye, and three sides have what appears to be a dragon passing gas. 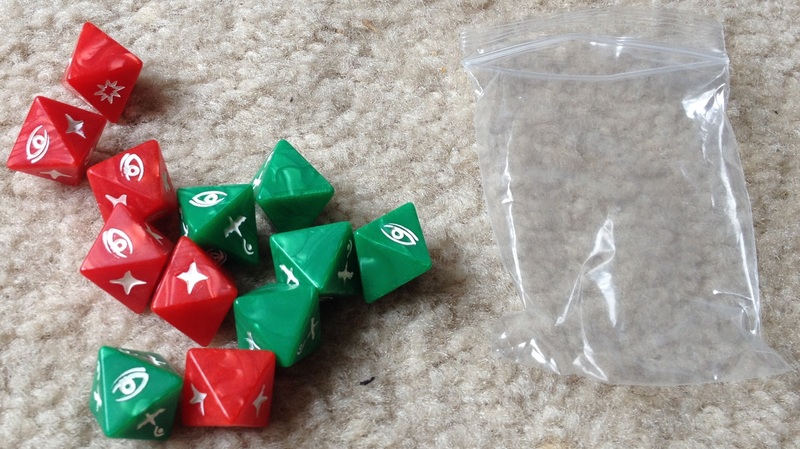 The red dice have three blank sides and three different icons, for a total of four possible options that can occur: you have what looks like a star, an eye, and an explosion. As you’ll see in the full review, these symbols relate to hitting, dodging, deflecting and concentration. 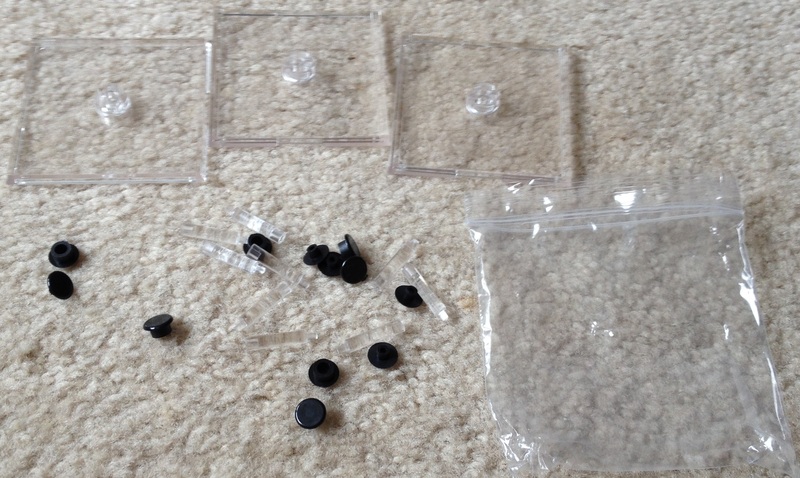 In one of the plastic bags you find three transparent plastic stands, nine transparent plastic pegs and a bunch of little black things. What could these be for? The stand and pegs combine with the dragon figures we saw earlier to make the full finished miniatures. They are a little wobbly on the stands, but they look great! Scale-wise, the dragons are smaller than the giant dragons from D&D Miniatures but are on par with the regular sized ones. They’re much smaller than Warhammer dragons though. 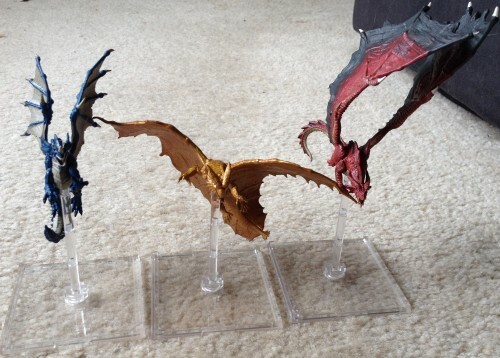 The paint jobs are in line with what you would expect from pre-painted minis, although I know some diehard mini painters are going to want to at least add a wash to the Copper Dragon to give it some details. They’re quite nice looking overall though. 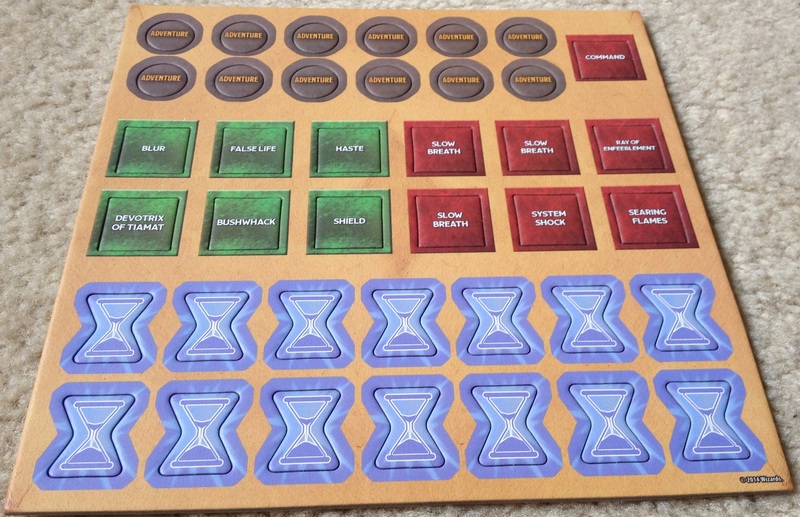 The first of several sets of cardboard pieces, containing tokens, dials and other pieces you are going to have to punch out. There are a LOT of pieces here, so there will be a decent amount of time spent setting up the game before you can actually play it. I was not actually expecting the game to have this many parts. The second set of punchables. The third set of pieces you’ll need to punch out. This is primarily for the blue dragon. 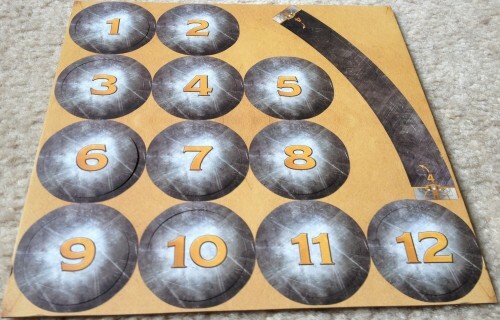 The fourth set of cardboard containing pieces you’ll need to punch out. We’re almost done. Hopefully the sheer number of pieces hasn’t scared off those of you used to games with more rules-lite systems or less bits and nick-knacks to keep track of. The fifth and final set of punchables. Yes, that’s a LOT. 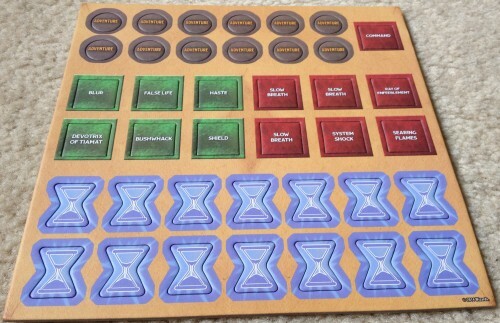 This set primarily contains objective markers. 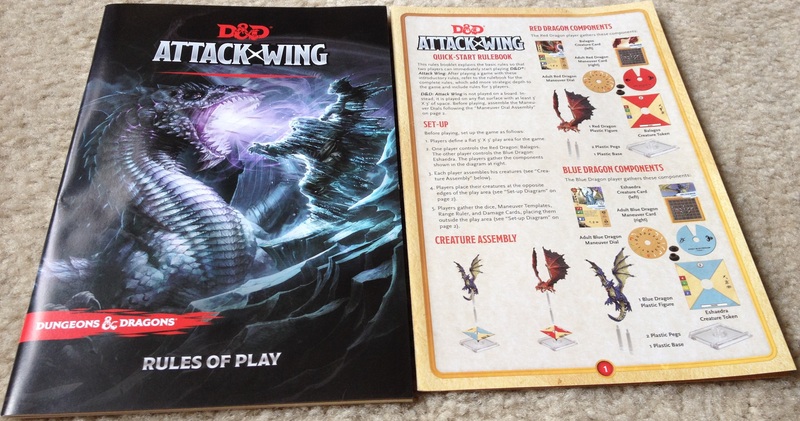 Here are the two different rulebooks for D&D Attack Wing. 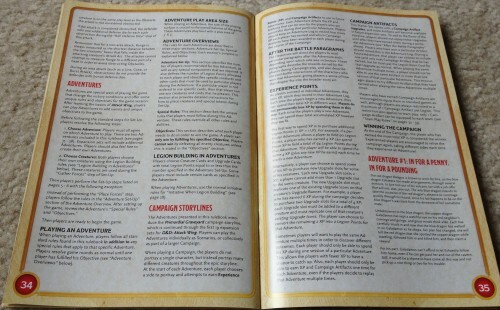 The smaller booklet is the Quick Start Rules set, and it is only four pages long. The full rulebook is a whopping forty pages, complete with teeny-tiny text. This is by far the most rules-heavy product WizKids has put out, so those used to Dice Master or HeroClix might be in for some severe culture shock. I know I personally was expecting something closer to those than, say, Warhammer in terms of the sheer amount of mechanics, but I was definitely wrong in that regard. It will be interesting to see if the rules are really easy to digest and learn or if D&D Attack Wing might be too intense for the usual WizKids clientele. The components overview page from the rulebook. 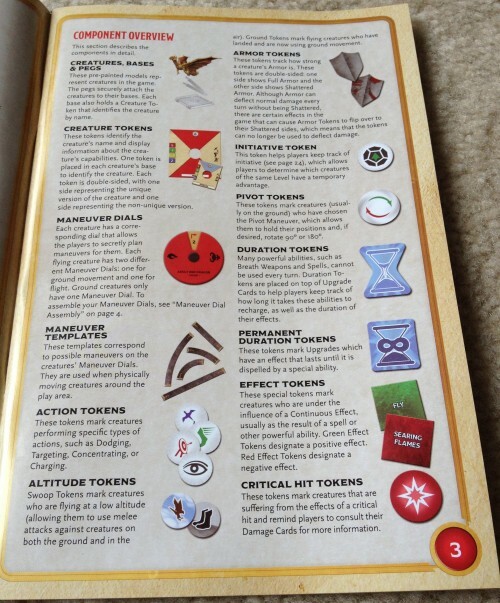 There’s actually a second page detailing the components – that’s how many there are in this game. 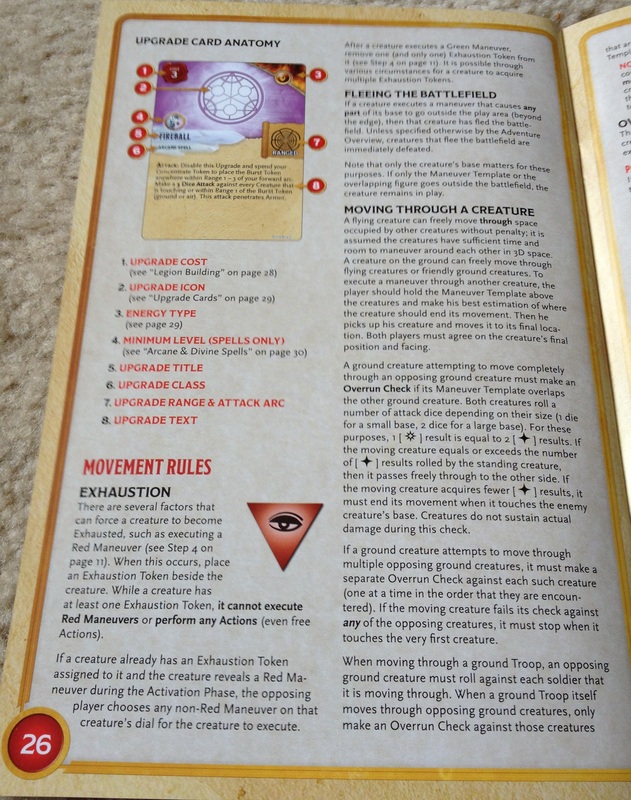 Another page from the rulebook – this one talks about upgrade cards and movement rules. Here’s a two page spread from the rulebook (the last look I’ll give you). I strongly suggesting clicking through the larger version of this picture if you are at all interested in the game. 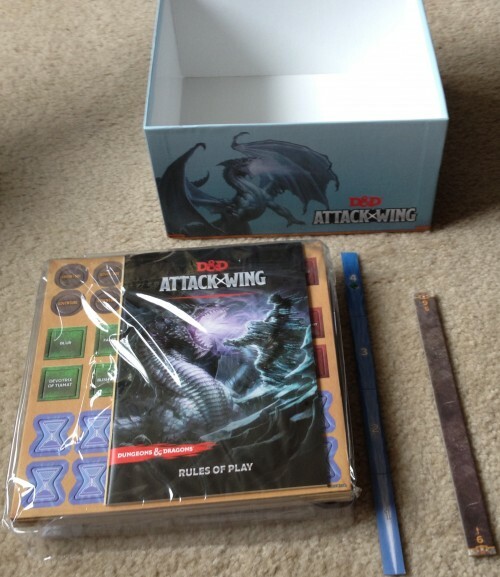 This details how to create adventures with D&D Attack Wing instead of just skirmish battles. It also talks about campaigns and experience points. That’s pretty awesome and shows that D&D Attack Wing is so much more than your regular rules-lite skirmish game. I think some gamers are going to love that WizKids has made something this detailed and deep, while others who were hoping for “D&D Clix” might be a bit disappointed. Hopefully both sides will at least give the game a try though! Here are all the conditions cards sorted and stacked by condition type. Yes, there are indeed FIFTEEN different conditions that can occur. 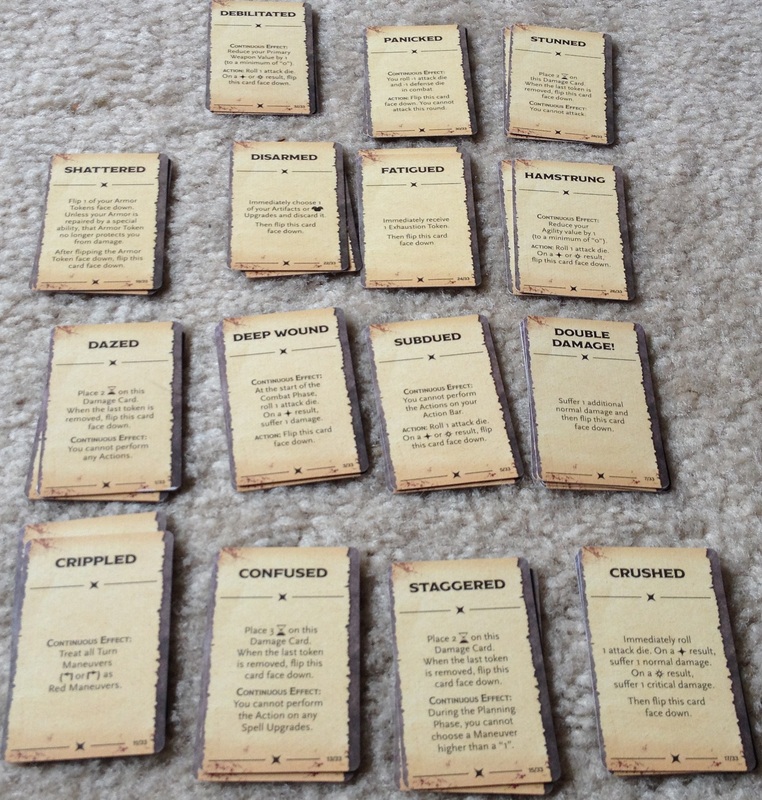 Here is a small sampling of the other cards in the game. 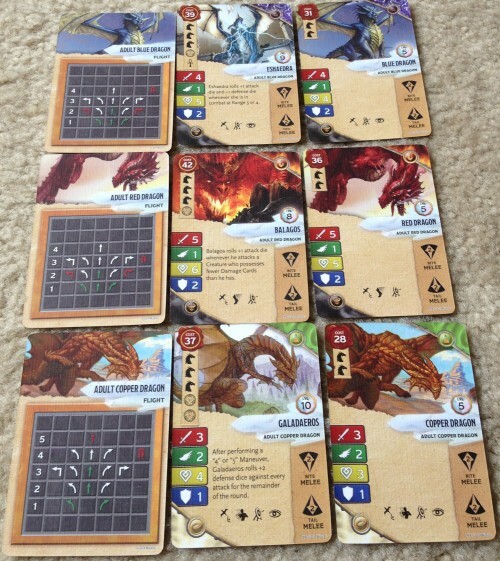 I’ve chosen three cards for each specific dragon type in this photo. If you click through to the more detailed version you’ll be able to see that one of the cards is the maneuver card for the dragon and the other two are creature cards that you to designate your dragon’s stats. One is for a lower cost but weaker generic dragon while the other is ore a named dragon which costs more points to use but is also more powerful. Of course, in this starter set, army building points won’t really come up. Here are nine of the upgrade cards available in the game. Again, this is only a small selection. 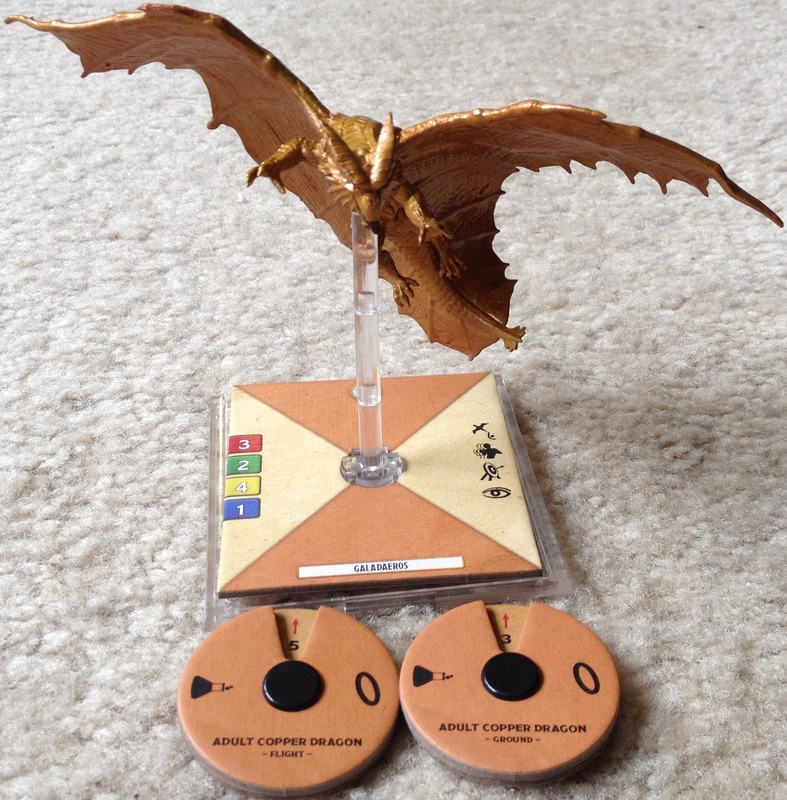 Here’s another look at the Copper Dragon, but this time with all of his pieces fully assembled. Notice the base now contains his creature token (which is double-sided) and I also have completed the Heroclix dials that the figure will use (one for ground and one for aerial maneuvers). 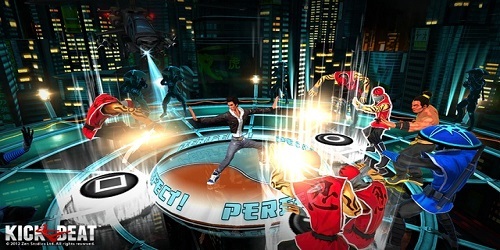 Yes, the game makes use of Heroclix dials, D&D licensing and Fantasy FLight Games’ Flightpath. Truly, D&D Attack Wing is a mix of many things…and trademarks. You’d be surprised how many logos are on the bottom of the Starter Set box! Here we are with our twenty-fifth and final picture for this immense unboxing. This picture shows everything the D&D Attack Wing Starter Set comes with. I still have a lot of bits to punch out and rulebooks to read before I can play, but hopefully this unboxing has piqued your interest in the game enough that you might check it out in stores now or on release date, depending where in North America you are. 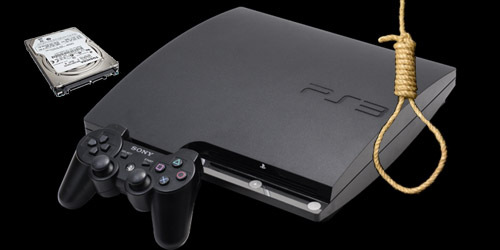 Please also come back in a few days when we have the full review up. 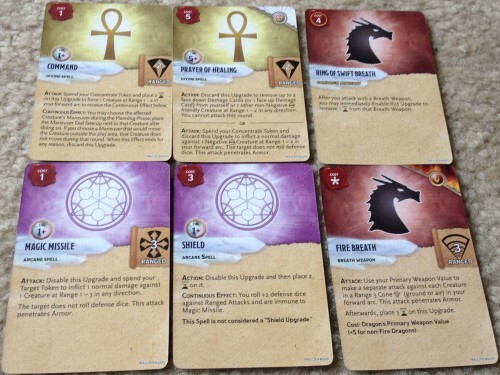 Remember, there are seven expansion sets that you can pick up on day of release if you really like the game or want to use something other than dragons. I’m really interested in the set of two wraiths and the sun elf guard. Whether or not I pick those up will depend on what I think of the Starter Set though. Right now I’m really impressed by all you get in the D&D Starter Set for your hard earned disposable income, but I am wondering if the game is a bit too rules-heavy compared to other WizKids products. Either way, I’ve got three different Warhammer armies and two 40K ones, so I think I’ll be able to learn the rules of this skirmish game just fine. Still, compared to the old D&D Miniatures game which I still have like a thousand figures for…D&D Attack Wing looks like there is going to be a heck of a lot more to it in terms of mechanics and rules. We’ll have to wait and see how it plays. 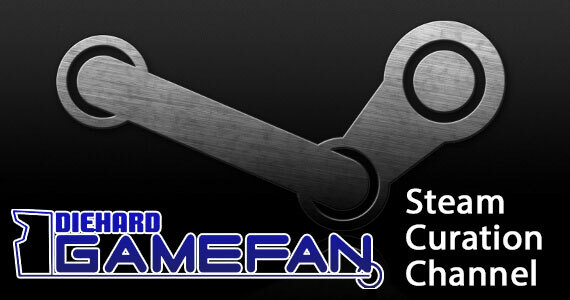 Hopefully I’ll see you back for the full review here on Diehard GameFAN.